Telangana American Telugu Association(T.A.T.A. ), New York, organized its first winter coat drive for homeless people in Suffolk County, Long Island and New York City. Because of the huge donations, T.A.T.A. NY was able to distribute more than 1000 winter items (winter coats, shoes etc.) to Salvation Army, other Social Service Organizations in New York City and also donated some of the coats to Shelter less people in NY City. With the critical support of Telugu community and the generosity of individual donors, TATA exceeded its goal for this year. Ranjeeth Kyatham, Regional Vice President, spearheading the drive, said the T.A.T.A. Coat Drive is a unique humanitarian event organized in New York, and thanked every donor for their generosity. He also thanked all the T.A.T.A. volunteers for their untiring efforts in making this drive a huge success. While addressing the Media New York's TATA team pledged that they want to take these organizational activities to next level by participating and organizing social activities in mainstream America as well as in motherland India. In that pursuit, Dr. Pailla Malla Reddy contributed Rs. 50 lakhs and Dr. Sudhakar Vidiyala donated Rs. 10 Lakhs to Mission Kakatiya in Telangana State. Dr.Malla Reddy also donated Rs. 13 Lakhs to Telangana Samskrutika Sarathi team led by Rasamayi Balkrishna for promotion of arts and cultural activities. Recently in December 2016 T.A.T.A President Jhansi Reddy did couple of Community Activities in India, visited lot of schools and donated school bags, provided digital class rooms, drinking water facility to the students and donated money to build the infrastructure of the schools. T.A.T.A is going to Donate ECG Machine and ultra sound machine to them. TATA team appreciated the donors for generously donating the winter clothes for the poor and needy. The entire event was supported and encouraged by Dr. Pailla Malla Reddy, PhanibhushanTadepalli, Madava Reddy Uppugalla, Dr.Sudhakar Vidiyala and Sharath Vemuganti. 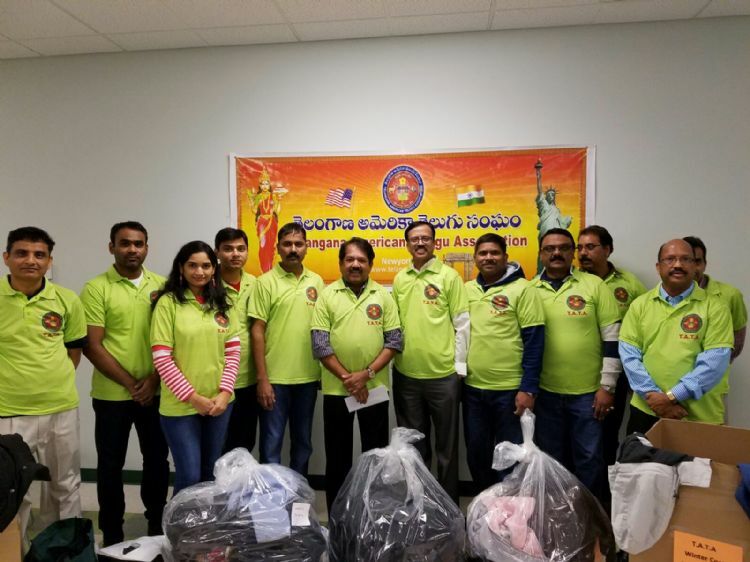 The drive was ably supported by the Regional Coordinators Sahodar Peddireddy, Usha Mannem, Mallik Akkinapalli, Pavan Ravva, Satya Reddy Gaggenapally, Srinivas Gandham and Yogi Vanama, Krishnasri Gandham, Rama Vanama and Jayaprakash Enjapuri New York Adhoc Committee members and Ashok K. Chintakunta, Madhavi Soleti, Srinivas Guduru from National Team, under the guidance and advices from the Board of Directors, Sudhakar Vidiyala, Madhava Reddy Uppugalla and Phanibhushan Tadepalli.